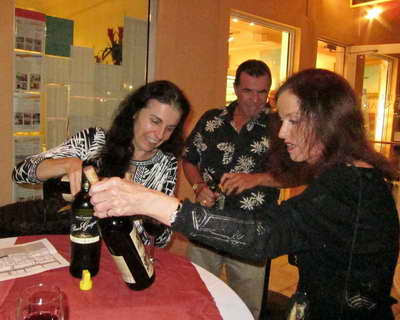 Naples revelers strolled up and down 5th Avenue South on November 19th, driving or taking the Marino Group's trolley to nearby restaurants, sampling at least 2 wines along with each restaurant's food. It had a haphazard 5:30 p.m. start, as a few places were set to start at 6 pm, not 5:30! Not a problem; we just went to the next spot. By the 9:30 p.m. close, people were more than full! Curiously, many of the wines offered were supplied by a separate vendor, so if you liked a particular wine, it was not carried by that restaurant! Several restaurants offered the very same mediocre wine. After sampling food and at least a red and a white wine at each of over a dozen spots-who cared! We picked up our $40 wristbands and wine glasses, and started with mini chicken cordon bleu and an empanada-like triangle at McCabe's Irish Pub, enjoying Jerry Pellegrino's live guitar music. 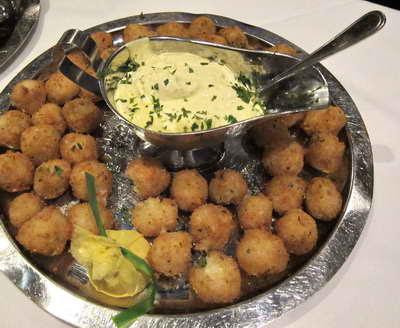 Truluck's, once known as "the" seafood spot on 5th Ave., served fried breaded chicken fingers, fried rice and crab balls 'n dips. I enjoyed them-I do prefer Popeye's over Truluck's chicken. One miffed customer groused, "Truluck's chef must have gotten a steal on this "chicken of the sea" and a big bag of rice, or else they're going belly-up." Smart restaurants offer a nice tasting, small portion of mid priced cuisine. This attracts new customers, and keeps costs down. I'll admit Truluck's offerings were nicer at previous Wine Tours, when they served signature seafood, not fried chicken fingers. Look out KFC! The Jolly Cricket did a yeoman's job, offering a beautiful cheese and fresh fruit platter, and delicious Scotch eggs-a hardboiled egg encased in sausage, breaded, and fried to perfection. Let the newcomer show up the tired old guard! The jazz pianist made us want to return! Bella Maria offered tasty Chilean-style croquettes and Chilean wines. 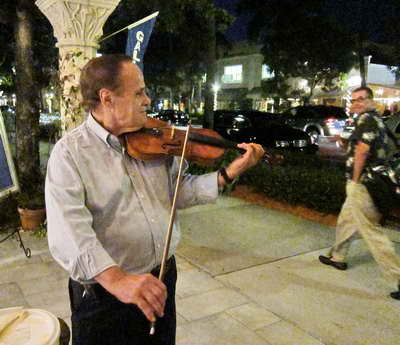 Ristorante D'Angeli's owner, Angelina, personally poured Italian wines, as the violinist serenaded guests. That's al fresco dining in style! She offered various pastas, gnocchi, bruschetta and nice canapes. The Restaurant of the Angels does it right. 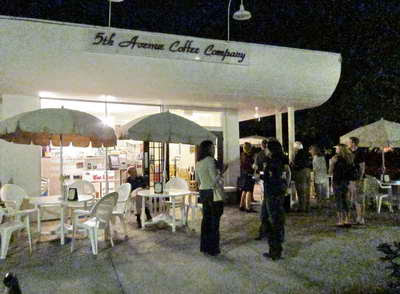 Fifth Avenue Coffee scored big with savory panini's-we'll be back! People descended on Roy's tasty mini molten chocolate desserts. They have a new chef; Chef Javier Vasquez is gone. Olio's Executive Chef Scott Sopher's generous offerings were highly rated by guests. He served bacon-wrapped scallops with a delicous sauce, several flatbreads, mini-eggrolls and mini quiches. Bayfont Inn's Bambu Tropical Grill had Swedish meatballs, cheeses, dips and fresh fruit. Other participants include Zizi at Bellasera, Little Italy, Bice, Pinchers Crab and Riverwalk. The Marino Group kindly provided the shuttle bus all evening, and Mercedes-Benz of Naples also assisted. People were happy. Tickets sell out every year. The last busload at Olio's liked the food so much that they stayed for drinks and dinner. I polled about 15 people towards the end of the evening. From just the food samples' quality, people said they'd definitely return to Olio's, Jolly Cricket, Ristorante D'Angeli, Roy's and Bella Maria for a regular lunch or dinner. The lesser quality food at some other places did turn off potential customers. The sponsor-supplied mediocre wines were disappointing at an alleged "Wine Tour", especially as the bottles were at multiple restaurants. Some restauranteurs wisely substituted better quality wines, lest customers associate them with cheap quality wine. Customers don't appreciate paying $40 for an alleged "wine tour," then served $3 wine bottles. Fifth Avenue sponsors, put your better foot forward at the next "World Wine Tour." This event is a great opportunity for restaurants to offer customers better food samples than Lurcat's silly donuts and Truluck's fried chicken. Be shortsighted and cheap and turn people off, or utilize a unique opportunity to atract new customers, who pay $40 for decent food and wine. Bewildered Fifth Avenue merchants wonder why savvy customers have left $15 hamburgers, Lurcat's donuts and wine pairing, and $400 shoes behind, and now dine at Mercato and other spots.